Venezuela's election campaign is entering the final stages. While the media paints Marxist President Hugo Chavez as a clear favourite, his main opponent, Manuel Rosales has earned huge popular support. Caracas 25.11.06 This week has been one of closing rallies although today's events in Caracas merits especial mention. Caracas is a city of close to 6 million people, yet Thugo Chavez thought that blocking access to the city was going to affect Rosales' event. Mind you how stupid can this little soldier get? Since busing people from all around the country to fill Avenida Bolivar has become a revolutionary custom he must have thought that the Rosales camp was going to do the same. There's a good saying to describe Chavez' reaction "todo ladron juzga por su condicion" which means something like every thief thinks that everyone else is a thief. In any case here are some pictures taken from a billboard high above Francisco Fajardo highway by yours truly. The massive outpour seen today in Caracas is by no means an isolated event. Tomorrow or the day after I shall post photos of this week's events in Carora, San Carlos, Valera, Barinas, Merida, Caracas, Valencia and San Felix. A few days ago I invited chavistas reading this site to send pictures of Chavez' rallies similar to the ones I have posted, Chavez being the guy who's going to win hands down the election with 80% support and all, to gather similar crowds would be a piece of cake, wouldn't it? 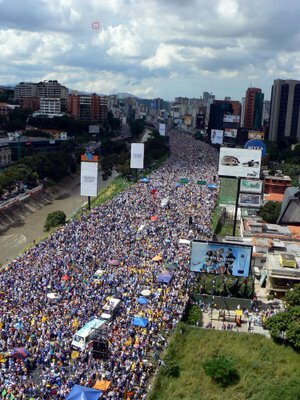 Pictures say otherwise for not even in his native Barinas two days ago was he able to outnumber Rosales' crowd. Don't tell this to MSM representatives though, they may choke with reality. An Assocaited Press poll relased at the weekend reports Chavez 30 points ahead. Unfortunately I think Chavez will win. But I think it will be a hell of a lot closer than 30 points. "With 78 percent of the votes counted by 10 p.m., electoral authorities announced that Chávez, 52, had secured 61.3 percent of the vote to 38.4 percent for Manuel Rosales,"